August 27nd, 2015 — NIGHT TIME 6:00P.M. – 11:00P.M. ALL INFORMATION IS TBA and subject to change as we plan for next year. Thanks for joining us last year! Location: Baldwin Hills Scenic Overlook, 6300 Hetzler Rd., Culver City, California 90232. 5K & Stone Climb Start Time: 7:00 P.M.
Stone Climb Only Start Time: 6:00 P.M.
(Stairs will be closed between 5:45 P.M. – 8:00 P.M. The Conquer The Overlook Climb 282 is coming back to the historic state park “Baldwin Hills Overlook”, Culver City! Come join us in bringing the aloha spirit to benefit the amazing charities of the Aztlan Athletics Foundation! 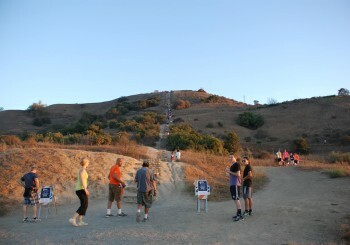 Bring your friends to this unique event and enjoy the 282 Steps Climb overlooking the beautiful cities of Culver City, Century City and Downtown Los Angeles. Run climb or walk yourself to the top! Official Race Results will be posted for online viewing. All participants will be able to access resource agencies, health & wellness, and specialty booths. Note: Beer Garden Open to 21 and over only. Will be strictly enforced. California or Driver Licenses ID required to access the beer garden. Day-of Registration: Saturday, August 22, 2015 same-day registration and packet pick-up. The stair climb waves will begin at 6:00 P.M. You will have a warm-up area and enough time to approach the stairs. This meet may be entered on-line by going to www.AztlanAthletics.org or www.ConquerTheOverook.Com (registration processing fee will apply). Same day registration and bib pick-up: 3:00 P.M.- 5:45 P.M. The climbers will be staged just below the start of the climb as registrants walk-up the trail path towards the climb. First-come-first-serve waves. We will have a separate PA system there to make periodic announcements & acknowledgments to the sounds of famous DJ. T-Shirt pick-up/Finisher Medal: After the completion of the 5K Run & Stairs Climb Challenge. Will take place in the expo area where participants can eat, and those who verify they are over 21 years old, have 2 complementary beer drinks included with registration. Note: Those entering the beer garden must show proof of ID and stay in the garden during consumption. Access to cross -fit and health/wellness booths with the sounds of DJs and bands for all. Commemorative T-Shirt guaranteed to pre-registered only! All others while supplies last. Volunteer orientation: 4:00 P.M. – located at the registration area. Sponsors booth & team set-up: 4:00 P.M.- 5:00 P.M.
Starts at the entrance of the park on Hetzler Road. Heads into the historic park and covers the trails and finishes up the 282 stone steps. Water stations at the bottom, at mile 2 and at the finish. 360-degree view of the foothills. Maps will be available on the day of the event. Please include your First & last name, gender, age, race type, city, zip, and email (if applicable). Media: This event is covered exclusively by Arroyo Vista Media Production, which is an affiliate of Aztlan Athletics, LLC. It includes photographs, video, web broadcast and other images of participants in the event. Entry into the meet is acknowledgement and consent to this fact. Photos may be posted for online marketing, displayed online, and social media. Race Director: The Race Director, Jose Luis Zavala, (Aztlan Athletics) is in charge of the event; questions regarding course, venue, awards, conduct of the participants, etc should be directed to Jose Luis Zavala (626/ 755-8489). FREE PARKING* & ACCESS PASS to food booths, entertainment, and goody bag. *Parking available on the streets. On Jefferson Blvd. V.I.P. Parking available on top of the hill for $10. Located inside the Nature Center & at the start.